Why is it whenever I see a clean kitchen, I feel compelled to step in and mess it up? That's what happened last night when, not a minute after DH finished doing the dishes, I began pulling out all my pie baking supplies -- rolling pin, flour bin, butter and more. My mission wasn't to fling around some flour (though that happened too), but to prepare a fresh raspberry pie asap. That's because we had harvested quite a crop of red and yellow raspberries at a U-Pick farm the day before and, as gorgeous as they are, the instant they're off the vine they begin to degrade. I knew I had to act fast. 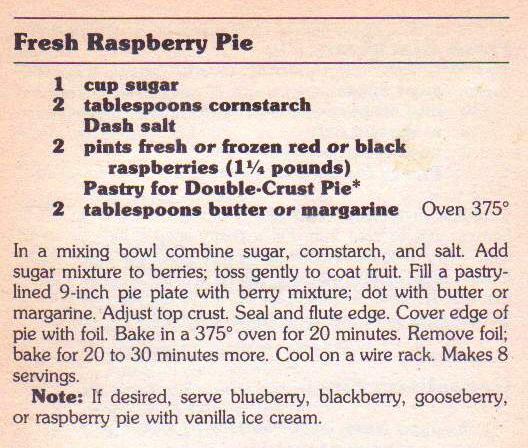 Finding a vintage raspberry pie recipe isn't that easy. Because it takes so many raspberries to make a pie, recipes usually feature another fruit like peaches. Also, fruit pie making in the old days (when women baked daily and ready-made pies weren't as available) didn't require a recipe -- prepare a crust, mix whatever fruit you had with some sugar and thickener (tapioca, flour or cornstarch), fill and bake. What could be simpler? But the c. 1955 Better Homes and Gardens New Cookbook, my mother's go-to cookbook, came to the rescue. I didn't weigh the berries, but used about 4.5 cups. 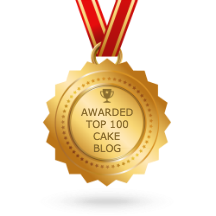 I can't show you a slice or tell you how it came out. That's where the delayed gratification part comes in. Because instead of putting the pie in the oven, I put it in the freezer to be served at my Rosh Hashana dinner in about two weeks. Anyway, last night I made just one pie, and after carefully wrapping it, I placed it next to our freezer's most prized possessions and legacy from my children's growing-up: two snowballs from the Blizzard of 1996. Perhaps serve the snowballs instead of ice cream with the pie... would surely grab some attention before they melted, anyway. And you may want to triple check your facts on the "... my son no longer plays video games..."
Very funny, Allen! I tried to photograph those snowballs, but feared they might melt in the process. And we desperately need a new refrigerator, and I'm worried about the fate of those during the transition. And Peter *may* play some video games, but they're not as attractive to him as many other vices!